Teaching assistants in Derby have voted to end months of strike action over changes to pay and working time. 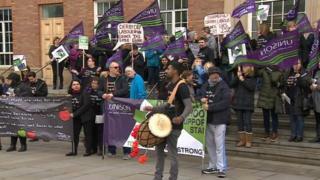 It brings to an end a row over Derby City Council's changes to school support staff contracts, which Unison said would see individual teaching assistants lose £6,000 a year. A cash lump sum for some of those affected has been agreed. Derby City Council said it was "delighted" the contract offer had been accepted. The long-running dispute, in which teaching assistants had been supported by Labour leader Jeremy Corbyn, had forced some schools to close during strike action. This new deal that has been agreed will see the worst-hit workers share £2m to compensate the loss of hours. The offer also includes a new 52-week flexible contract for all support staff starting in September. Parent Simon Maingay said he was pleased that the dispute was at an end. He said: "I was on the verge of having to book unpaid leave [to look after my son] because I had used annual leave beforehand. "I'm very, very relieved that everything is back to normal." Image caption Dave Prentis said his members could return to work with "their heads held high"
Unison general secretary Dave Prentis said: "School support staff are relieved this dispute is behind them. "Now they can concentrate on the great work they do helping children in the city's schools." The council's initial pay review centred on what it said were "inconsistencies" where some teaching assistants were being paid the same amount as other employees who worked more hours. Councillor Baggy Shanker said: "This [vote] allows us to move on now. "All our teaching staff are back at work as they have been for the last couple of weeks. "I'm absolutely delighted it's over."